Fr. Thomas Moore has spent his whole adult life serving Christ. With a BS in Psychology, he has worked in prisons, drug and alcohol rehab, hospitals, a men’s homeless shelter, and spent two years in the Methodist seminary at Emory University in Atlanta, GA. He moved to San Francisco where he received his MA in Family Counseling from the University of San Francisco, earned a Professional Counselor License, and for many years was the Social Service Director at Raphael house, a homeless shelter for families. Fr. Thomas was blessed to discover Orthodoxy in San Francisco, and after an unsuccessful stint at a monastery (The Abbot told him “a sad monk is a sad monk”), God brought a wonderful Orthodox woman into his life. He has been married 28 years, and has three wonderful Orthodox children. He was ordained Deacon in 1992 by the ever memorable Archbishop DMITRI, and served at what was then the fledgling Holy Apostle Mission in Columbia, SC. 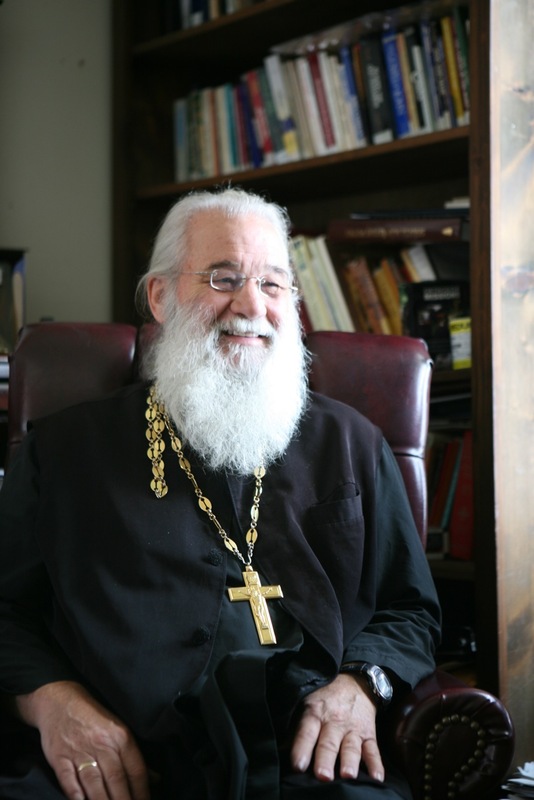 He worked as Clinical Director for an orphanage for five years before moving his family to New York where he earned a Master of Divinity from St. Vladimir’s Orthodox Seminary and was ordained Priest in 1997, again by Archbishop DMITRI. After helping start St. Innocent’s mission in Macon, GA, Fr. Thomas returned to Holy Apostles where he has been serving ever since. Fr. Thomas has a wonderful, loving community of all ages and backgrounds, and they have managed to build a beautiful temple to give Glory to God. Fr. Thomas is very active in local charity work and a few years ago, he and a group of volunteers went to New Orleans to help International Orthodox Christian Charities (IOCC) with the relief effort. He was later invited to be an IOCC Frontliner. As God would have it, after several years of training, there was a massive flood in Columbia, and for the following year the church housed work teams from around the country to help rebuild destroyed homes. Fr. Thomas has been elected to the Metropolitan Council of the OCA and serves as Chairman of the Ethics Committee. In addition, he is on the board of the Department of Christian Service and Humanitarian Aid. Fr. Thomas was chosen Dean by the priests in the Carolinas several years ago, and their Deanery has grown from 5 missions to 14, several of which are now full Parish Status with four building programs currently underway. After being nominated, Fr. Thomas was chosen for the Orthodox Christian Network's 2016 OCN Hero award. Fr. Thomas claims to be a good example of a saying he heard once: “God can carve the rotten wood, and ride the lame horse”. He is an amateur book binder, carpenter, and peripatetic Orthodox Pilgrim. He has visited Churches and monasteries on Mt. Athos, Russia, Romania, Greece, England, and Ireland trying to make sure that what they practice at Holy Apostles is faithful to the Orthodox traditions he has witnessed around the world, of which the greatest of these is charity. Deacon Nicholas was born into a military family and served the country himself as a member of the military for 20 years. He has been all over the world and enjoys meeting people from other cultures and countries. He graduated from the University of Northern Colorado in 1971 and subsequently entered active duty in the United States Air Force. During his 20 years in the USAF, Dn. Nicholas flew in F-4s and was an Instructor in Flight School. Later in his career, he became a War Planner and served two tours in that capacity. He retired from the USAF in November 1991 and went to work in the transportation industry. Later Dn. Nicholas felt the Lord’s call and in 2006 enrolled in Seminary. He attended Wesley Biblical Seminary in Jackson, MS, earning a Master of Divinity degree in 2010. During his Seminary years, Dn. Nicholas was appointed as an Associate Pastor in the Church of the Nazarene and served in many ministries. He was active in Pro Life and served as a Prison Chaplain, not just visiting and preaching to the prisoners but also teaching them in GED instruction and providing their mandatory Drug and Alcohol instruction. He also oversaw and participated in the other external ministries of his church. During Seminary, Dn. Nicholas became aware of Holy Orthodoxy and became friends with a parishioner of a local parish and the priest of that parish. The allure of the Ancient Faith grew on him and in 2011 he made the decision to leave his church, resign as a pastor, and convert to Orthodoxy. He was invited by the priest of an Orthodox Church to come and help plant a church in Pelion, SC. He finished conversion, joined that parish and set to work doing ministry, serving in the church doing evangelism to grow the parish. In February 2011, Dn. Nicholas was tonsured a reader and he was made a Subdeacon in November of 2014. In November 2015, he was ordained a Deacon by Metropolitan Hillarion of ROCOR. The parish in Pelion ceased to have regular services in the Fall of 2016 when the priest changed jobs and he was often out of town. The decision was made to retire Dn. Nicholas so that he could find another parish outside of ROCOR, as there was no place for him to serve locally. He came to us shortly after that and decided that Holy Apostles was a good place for him to serve. Dn. Nicholas continues to serve as the parish Deacon and is involved in several ministries of our parish. Specifically, he does Pro Life regularly by praying outside the Planned Parenthood facility twice weekly and he does home visits for members of our parish who are home bound. After a life time of moving, Dn. Nicholas has decided that he is ready to stay put, not only in the area but in our parish. Subdeacon John Aaron Brown was born and raised in South Carolina. As a child, he attended a mix of Christian churches, at first raised in Christian Science and then later attending Lutheran and Baptist churches. During college, Sdn. John learned about Orthodoxy during a Christian theology class and began visiting Holy Apostles. He was quickly convinced of the truth of Orthodox theology and the sincere faith of the Holy Apostles community. He was baptized into the Church in 2006, tonsured as a Reader in 2009, and ordained as a Subdeacon in 2012. Sdn. John is married and his wife and children can regularly be seen at the church services. He serves as a Reader, altar server, and by helping organize and train Readers and servers. Sdn. John has a Bachelor’s Degree in Religious Studies from the University of South Carolina and is working on a Masters of Applied Statistics. He currently works at the South Carolina Department of Education, where he enjoys programming with the SAS computer language. He is thankful this job provides enough annual leave that he can often attend weekday services.